Gone are the days when minor orthodontia cases require traditional wire braces with accompanying headgear. Invisalign has made it possible for people to create the smile of their dreams without anyone even noticing. The Invisalign program starts with a casting of your current smile. Your current smile is analyzed and then the ideal straightened teeth state is plotted on a computer. Customized sequential trays are then created that that gently shift your teeth to the desired position in a matter of months-with most people not even noticing they are there. The secret is in the specialized clear plastic used as the sequential braces. You can even pop them right off for eating and whenever else needed. Our cosmetic dental practice, OKC Smiles, is proud to offer Invisalign braces as a new alternative to the traditional wire braces. Many people have had traumatic experiences with traditional braces or have had friends that went through them. Invisalign removes the embarrassment from orthodontia and and delivers stunning results as well. Now you can have the best of both worlds. Though Invisalign does work for many, some people may not be candidates for Invisalign braces—depending on the severity of the misalignment and other potential issues. If you are a candidate for clear braces, you will be amazed with the effectiveness of the treatment. People are literally thrilled that they have the opportunity to get that perfect smile without needing to use traditional braces, ESPECIALLY adults who have put off braces for years because of fear, embarrassment, career and any other number of reasons. Don’t let your imperfect smile hold you back another day. 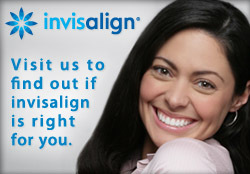 OKC Smiles is here to help and partner with you in your Invisalign treatment plan. Schedule a free clear braces consultation with your dentist in Oklahoma City today to see if Invisalign is a viable option for you to help you achieve the smile of your dreams.